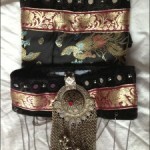 shape: instead of having a deep V at the front, and the front and back cut equally, I made the front piece go from hipbone to hipbone, to account for the medallions, and be straight; the back piece was made with a slight curve to account for my hips, so it looks a bit like a dipped front. I am still using that first pattern I obtained ages ago, just chopping in different parts to get the shape/effect I want. 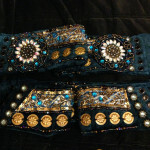 materials: as I suspect the very first belt I made using denim might be stretching, this time I made the base using a double layer of denim and calico, to provide extra strength and support for all the metal trinkets. I did rolled hems with the serger on each piece to make sure it didn’t fray. So, what’s left to do? 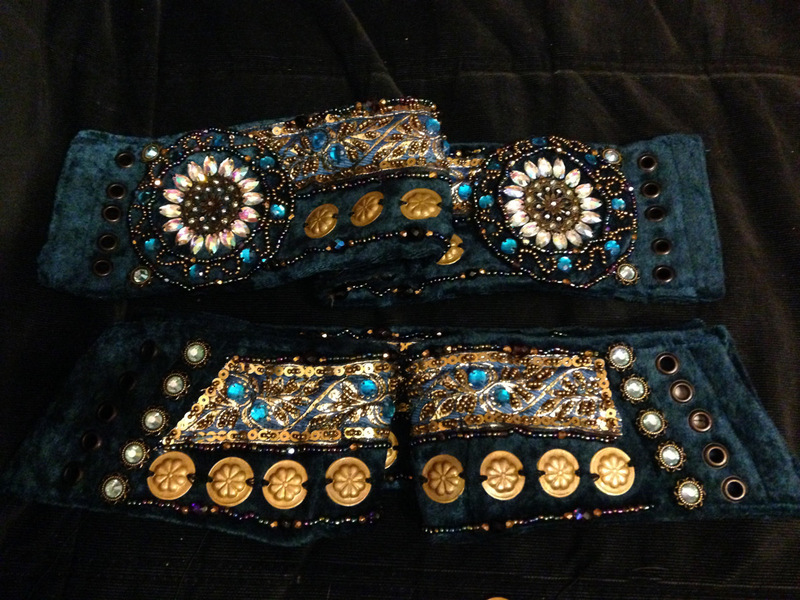 A mermaid skirt in teal stretch velvet, although I will be using a different material this time. And hopefully I will also be able to use this set as part of an ATS costume, with purple and teal skirts and the white lace choli that I made back in May and haven’t photographed yet. 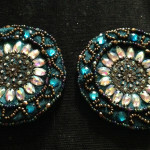 Teal Belt, part 1: beaded medallions and drapes.